Indigenous leaders in Brazil say they have won an important victory for the rights of their community, at a key hearing of the Supreme Court. Eight of the court's 11 judges voted to keep a reservation in the Amazonian state of Roraima as a single territory. The ruling would mean the eviction of a group of non-indigenous farmers who live and work in the reserve and have resisted attempts to move them. But a final ruling was postponed and is not expected until next year. The session was suspended after one judge said he needed more time to consider his decision. There are more than 100 similar cases before the Supreme Court but it is thought this ruling will establish an important legal precedent, which touches on a number of sensitive issues. Indigenous lawyer Joenia Battista de Carvalho said she was disappointed the final outcome would be delayed. "I was expecting the case to be concluded today - unfortunately our feeling is one of half a celebration, because what we wanted to see was the practical result of this - to see our land free of any invaders," she said. Local Mayor Paulo Cesar Quartieiro said the government was using it support for indigenous rights to hand over control of parts of Brazil to foreign groups. 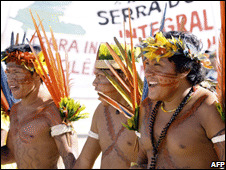 At the centre of this case is a large area of land in the far north of Brazil, known as Raposa Serra do Sol, which is home to up to 20,000 Amazonian Indians and which was approved as an official reservation in 2005. Indian leaders said a ruling against them would signal that it was acceptable for land grabbers and loggers to invade their territory. However, around 200 rice producers who also live and work in the area said a ruling in favour of the resreve would force them to leave, and undermine economic development in the state of Roraima. To add to a complicated dispute, one indigenous group in the reservation supports the farmers, and the issue has been the subject of growing tension and conflict. The Brazilian military has also expressed concern that a quasi-autonomous Indian reservation running along a lengthy section of Brazil's frontier would have implications for national security. That view is rejected by indigenous communities who say it would remain Brazilian territory. To allay this fear, some of the judges made clear in their rulings that the army and police should have full access to the region without having to consult indigenous leaders. But the BBC's Gary Duffy in Brasilia says it will only be clear in the months ahead if the court has done enough to ease the still simmering tensions surrounding this debate.